When your work takes you outside into unfavorable weather, you need and want insulated outerwear that will keep you dry and warm. This Wrangler Insulated Slate Grey Men's MJK015 G Chore Jacket can do just that. It's designed with insulation and a water-repellent fi ... (see full details) (see specifications) #MJK015G. When your work takes you outside into unfavorable weather, you need and want insulated outerwear that will keep you dry and warm. This Wrangler Insulated Slate Grey Men's MJK015 G Chore Jacket can do just that. It's designed with insulation and a water-repellent finish to keep you feeling comfortable throughout your day. Plus, the Wrangler men's chore jacket is made to be durable and functional to get you through all of your work duties. This men's insulated jacket is well-made, so it will last you a long time. It's crafted from Mini Ripstop fabric, which is just as hardy as the name implies. The rugged Ripstop fabric is composed entirely of cotton. As a material, cotton is strong yet soft on your skin and won't leave you feeling like you're weighed down. The slate grey jacket only weighs 8.5 ounces, so you won’t struggle beneath the weight of an outer layer as you move around and engage in work and other outdoor activities. The men's outerwear is triple-needle stitched for enhanced durability, while the elastic cuffs and straight bottom hem offer a comfortable fit. 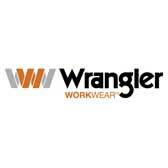 The design of the Wrangler work jacket is such that you will feel satisfied wear after wear. In addition to being made to feel comfortable and last throughout many wears, this men's slate grey jacket is perfect for wearing outdoors. It's especially useful in cold and wet weather conditions because it features qualities that help you stay warm and dry. For starters, it's built with Heatseeker 100g Polyfiber Insulation. The insulation keeps you warm in cold weather by trapping your body heat and preventing the wind from chilling your skin. Plus, the stand-up collar helps to keep the wind out of the men's jacket so your neck stays toasty warm. When the weather is wet and you're met with rainfall, this Wrangler outerwear will do the trick with its water-repellent finish on the exterior. The finish causes water to bead up and roll off instead of saturating. Lastly, this men's water-repellent jacket is functional, as it features multiple pockets and a front zipper closure. One of the front pockets is lower and features a zipper closure to keep any valuables safe from the cold and wet weather you may face. Another pocket can be found on the chest, and it has a flap. The chest pocket features snap closure for easy access. Whether you're wearing this for work or play, the pockets will make your life easier. For comfort in the form of dryness and warmth that you want and need, get this Wrangler Insulated Slate Grey Men's MJK015 G Water-Resistant Chore Jacket here at Working Person’s Store today. Wrangler Jackets: Insulated Slate Grey Men's MJK015 G Chore Jacket is being added to your cart.